ShoreWaves Internet and Telephone is on a mission. 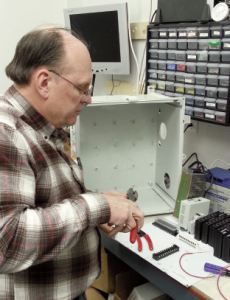 Left: ShoreWaves Founder Steve Fitzgerald assembles a ShoreWaves specialized tower control and power electronics. 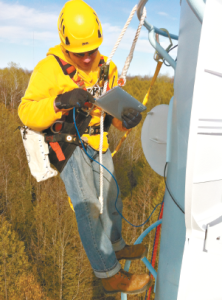 Right: ShoreWaves Network Engineer Zach Simpson commissions a new antenna (foreground) mounted to a water tower.